Mosquitos and I have never gotten along. I smack them with my hand every time I see them. They swarm me like thirsty vampires meeting their first human in decades, and leave welts all over my body every time they see me. Guess what, vampire insects – I have a new secret weapon. DIY, super-powerful, mosquito repelling, made ’em myself, citronella candles! I repurposed my Wildtree spice jars for this project, but you could clean out and use glass containers from old candles or Mason jars. Make sure your jars are clean and completely dry before you begin. To start, put a dab of super glue on the bottom of the wick tab and secure it to the bottom center of your glass jar. This will prevent your wick from floating up once you add the wax. 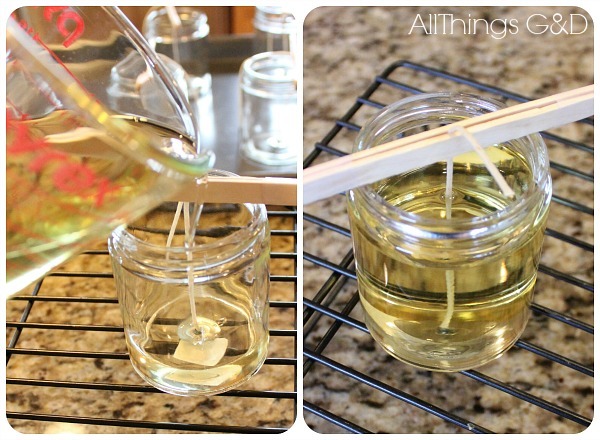 To keep your wick centered while the wax dries, secure it with two sticks taped together at the ends. I used craft sticks that I had on hand, but you could also use chopsticks or wooden skewers. Trim your wick just above the sticks (for now). 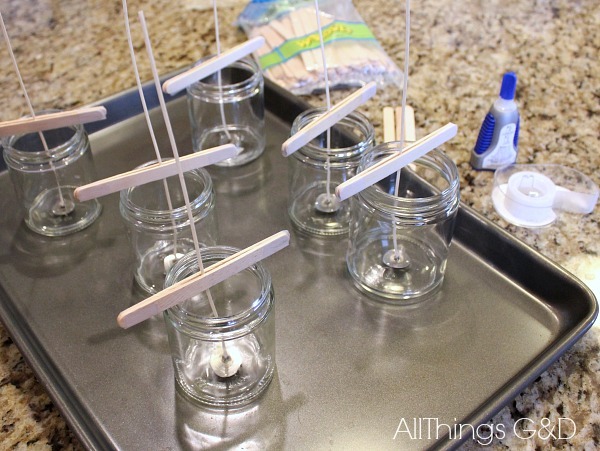 Once your wicks are secured and trimmed, place jars on a cookie sheet and put them in your oven at its lowest setting (mine was 170 degrees) until the wax is ready to pour. Warm jars will help your wax cool evenly and will be less of a temperature shock to your glass when you pour the hot wax in. I don’t have a double boiler, so I made my own out of a sauce pan and Pyrex glass measuring cup. 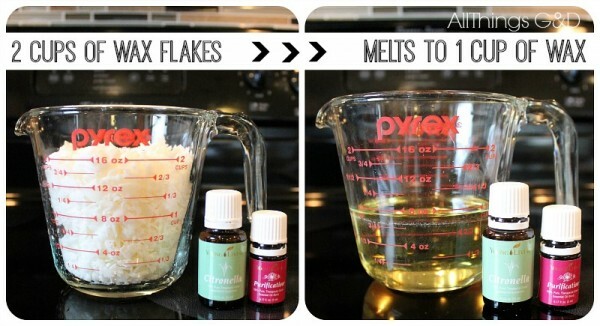 Fill your cup with wax flakes and place inside a saucepan of water to heat the wax. Bring water to a boil over high heat and then reduce to medium-low and continue simmering until wax is completely melted. I started out with 2 cups of wax flakes, which reduced (once melted) to 1 cup of melted wax. 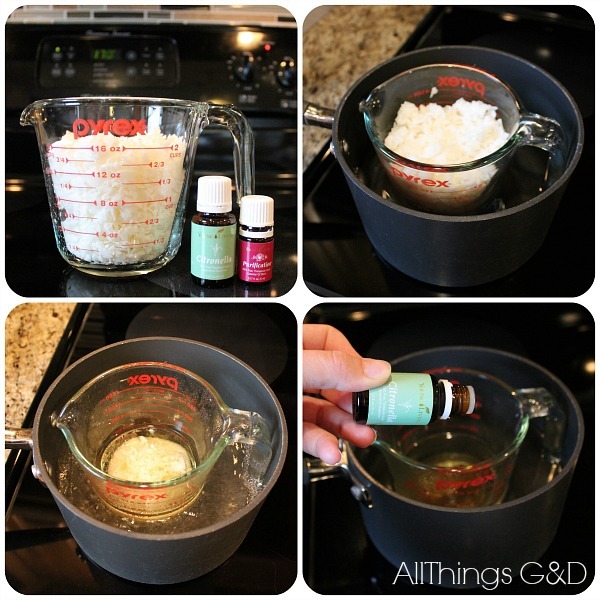 Once the wax was melted I added 10-15 drops of Young Living Citronella Essential Oil and 5-8 drops of Young Living Purification Essential Oil (per one cup of melted wax). Two cups of wax flakes melts to one cup of wax. 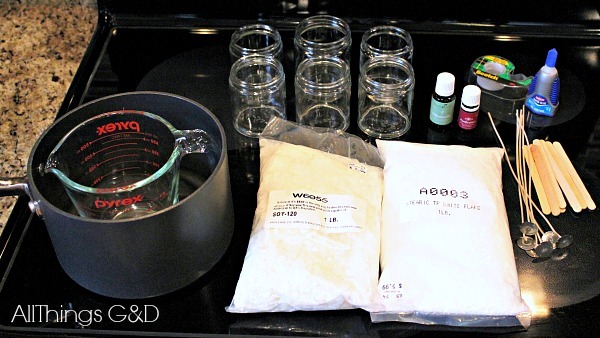 Once your wax is melted and the oils are stirred in, use a hot pad to remove your candle jars from the oven and your Pyrex from the sauce pan. 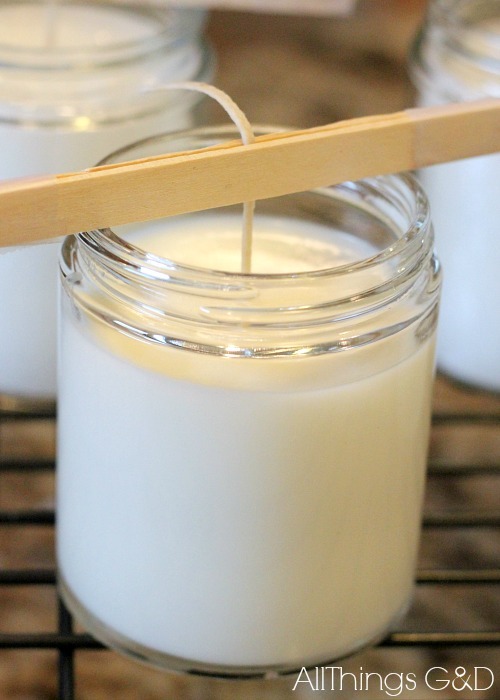 Carefully pour the wax into your candle jars, filling them up to the lip of the jar. Ensure that your wick is still centered after your pour (adjust as needed by gently moving the sticks). Cool your candles on a cooling rack. This might take a while depending on how large your candles are. I made several little candles and found that a one pound bag of wax flakes filled about 10 ounces worth of jars. 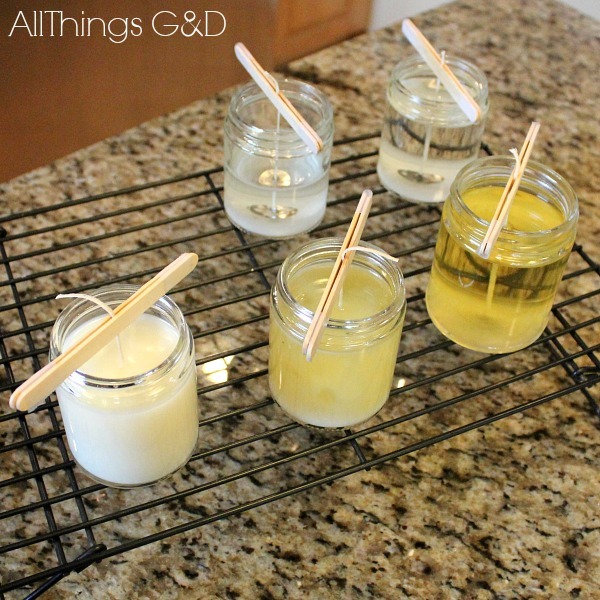 DIY Citronella Candles in varying stages of cooling. Now let’s talk about these oils – the magic ingredients! My friend Beth from Unskinny Boppy introduced me to Young Living Essential Oils. We’ve been using them around our home for about two months, and we’re hooked! The thing I like about Young Living Essential Oils versus other brands is that they are guaranteed to be undiluted, free of synthetic chemicals and 100% pure. These oils are powerful and effective and a little goes a long way! 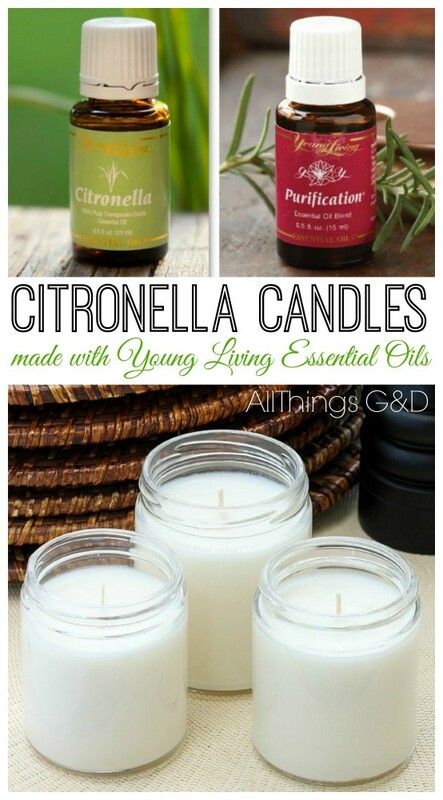 Young Living’s Citronella Essential Oil is more powerful than “citronella-scented” candles you might buy in the store to repel mosquitos. 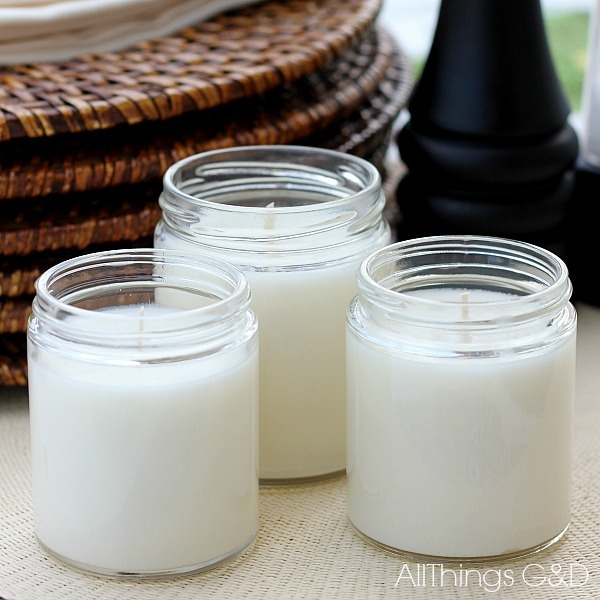 These candles are made with synthetic chemicals and mimic a citronella scent, but do not disperse actual citronella oil – THAT’S what really keeps those bugs away! 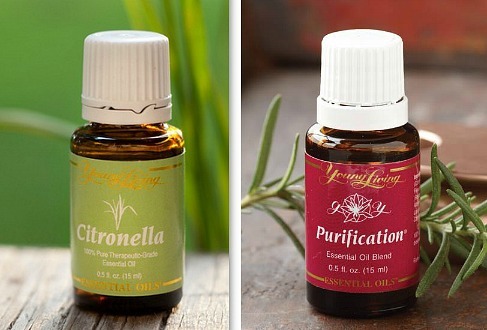 To give those pesky pests the one-two punch, I also added Young Living’s Purification Oil. Purification is an oil blend that cleanses and disinfects that air, neutralizing mildew, cigarette smoke and disagreeable odors. It also disinfects and cleanses cuts, scrapes, and bites from spiders, bees, hornets and wasps. It has many uses (I dapped it on a spot of acne and it cleared it right up) but for the purpose of these candles, I like that in addition to all this it also helps keep the bugs away! If you’d like to try Young Living Essential Oils for yourself, please CLICK HERE to sign up to shop as a retail customer (it’s free!) and I will receive a credit for your purchase (at no additional charge to you). I’m also happy to answer any questions you have, so feel free to email me or ask them in the comments. Thank you! UPDATE: I forgot to add! If you’re not familiar with using essential oils the price tag might shock you, so it’s important to mention that a little goes a long way, and these bottles last a long time. 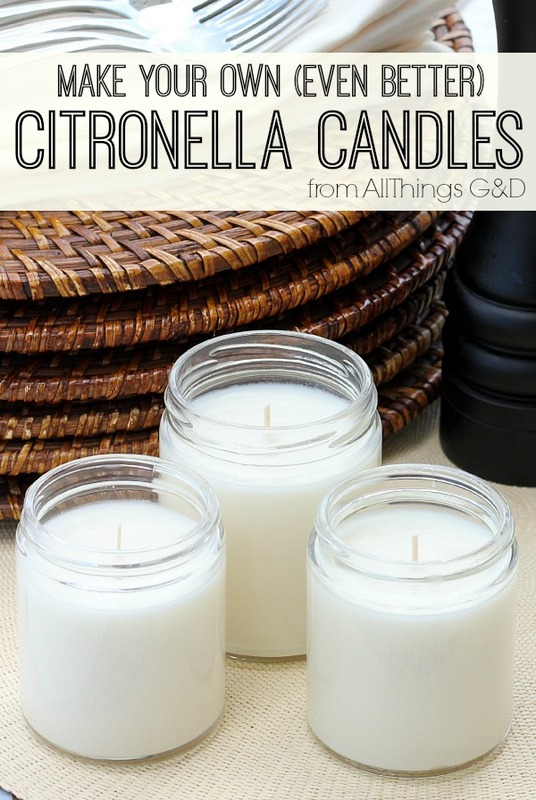 For example, 10 drops of Citronella Essential Oil per 1 cup of melted wax (which yielded 1.5 candles for me) breaks down to a total of $0.71 – that’s only 47 cents spent on 100% pure citronella per 3 oz candle. I used about 60-70 drops of Citronella for all of the candles I made and I still have a ton of oil left in my bottle for future use. 100% pure therapeutic grade Citronella Essential Oil (15 ml bottle/250 drops): $23.36 retail or $17.75 for Wholesale Members*. Purification Essential Oil Blend (15ml bottle/250 drops): $24.67 retail or $18.75 for Wholesale Members*. *Signing up as a Retail Customer is free and you can shop Young Living and pay retail prices. Another option is to sign up as a Wholesale Member (which requires the purchase of a starter kit; prices and products included vary) and you will receive products at a 24% discount. Please feel free to email me or comment below if you have any questions. 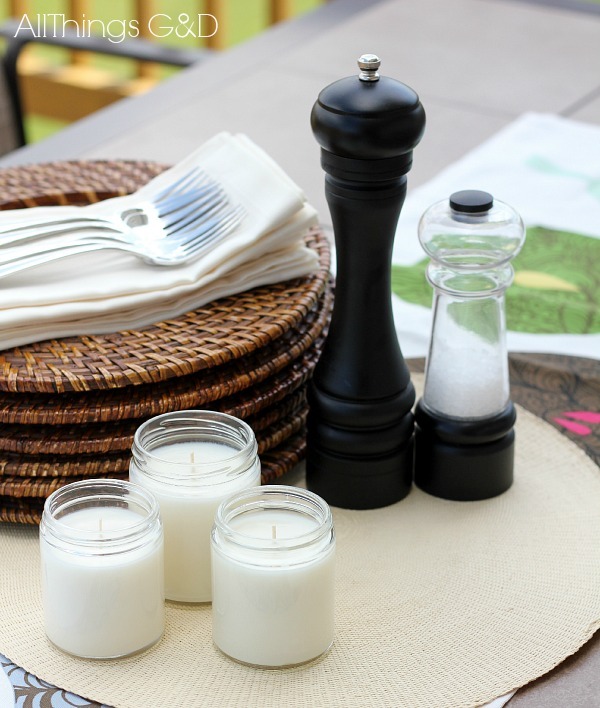 DIY Citronella Candles – the perfect accessory for outdoor dining! I will definitely be trying this recipe. I cannot be outside for more than 5 minutes without bugs bites all over me. I LOVE my Young Living oils. I purchased the starter kit about 6 weeks ago and have already used up about 5 oils. There are so many things they can be used for!!! Thanks Amber! I’m an oil newbie too, and learning so much! Which oils are your favorites so far? I’ve been loving the lemon for cleaning, and Kate loves Peace & Calming at nap time and at night – it’s been helping a lot with her sleep! We also used Thieves on her for a wicked cough a couple of weeks ago (she refuses to take medicine – the biggest reason why I wanted to try essential oils as an alternative) and her first night with Thieves was her first night that she finally got her cough calmed down enough that she was able to sleep without waking up hacking away. So far so good! Dusty, how did you use the Thieves oil? Did you rub some on Kate or spritz it? I’m sure there’s some kind of circle of life / food chain devestation from riding the world of mosquitos, but I’m willing to give it a shot for a few days and see what happens. You on board? I absolutely hate them, which makes sharing with my daughter (whose in a let’s-step-on-ever-bug-we-see phase) that we don’t kill bugs VERY hard. Especially when she sees me smack, swat, and pulverize them. But I’m also not a fan of breathing in regular citronella candles, so this may be a good solution! LOL Carla! Yes, please sign me up for mosquito mass destruction. I’m with ya! Super cute, but it seems like all the posts are DIY lately. Would love to have more updates on your healthy eating and family! Thanks for the feedback, Lin! I’ve definitely been in DIY mode lately, but look for more healthy eating and family posts coming soon! I really love Lavender. We have used it for sleep, bug bites, sun burns, allergies…it is usually the first one I grab and can be used for so much! So far, I use Thieves a lot for cleaning. I used your “recipe” and made cleaning cloths. I put a few drops of Thieves in with it whenever I make them. I like Stress Away a lot. It has helped me with anxiety issues and overall stressful moments. I use Purification to clean the air and on blemishes. It seems like every oil I have used, I have really liked. I haven’t used lavender much yet, but will now – thanks for the tips! I also love the idea of adding Thieves to the DIY disinfectant wipes – I’ll do that. Thanks Amber! I may have missed something but it looks like you’ll only get a credit on oils with your name & ID number. I will wait on your response to sign up. Hi Mary Beth, thank you so much for double-checking! Yes, that is true, I only receive credit for your purchase (at no additional charge to you) if you sign up as either a Retail Customer or as a Wholesale Member, using my referral link, which can be found here: https://www.youngliving.com/signup/?site=US&sponsorid=1751399&enrollerid=1751399. Signing up as a Retail Customer is free and you can shop Young Living and pay retail prices. Another option is to sign up as a Wholesale Member (which requires the purchase of a starter kit; prices and products included vary) and you will receive products at a 24% discount. Please feel free to email me or comment if you have any questions – I’m happy to help! Oh, thank you Lori! I didn’t notice that my link didn’t show up. I’ll fix that now. Thank you! We are so excited to make these candles at a baby shower this summer! Where do you recommend buying the candle wax pellets from? I’ve googled it but not had the best luck. Your bags look like good size.